Feel prepared to introduce a study of triangles! 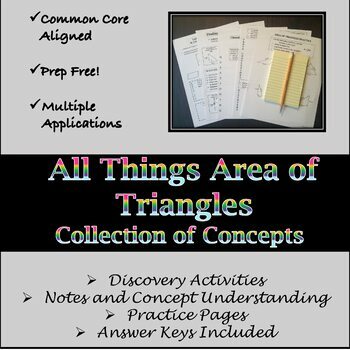 This collection concepts and activities is student centered and encourages student questioning and discovery. Application of prerequisite knowledge is required in discovering the formula for area of a triangle. Components are designed to evoke valuable student to student interactions and discourse, as well, question lead discovery. Let them WONDER and be AMAZED by where they go! !